Our Christmas tree is a time capsule decorated with memories disguised as ornaments. I’ve got two or three from my childhood as well as the obligatory “Baby’s First Christmas” ornaments for both of my daughters and our granddaughter, and we’ll be adding another one for the newest granddaughter this year. But the most precious ornament on our tree is not one that we bought. In late spring 1993, Christine and I moved to a rented single-wide trailer in the backwater regions (our yard flooded during any rain event, so literally) of Yell County after two months of apartment living had driven me stir crazy. We spent our first Christmas together in that trailer. For our tree, I cut a way-too-big cedar we found just down the dirt road that took up a quarter of the living room. We liked full trees. We liked them tall, too. I think I had to take another 18 inches off so it wouldn’t scrape the ceiling. We were poor as church mice back then. The core of who I am hasn’t changed at all, so if you know me it should come as no surprise that way back in 1993 I had two or three part-time jobs that I enjoyed rather than one full-time job that I hated. I think I averaged $125 a week income. Christine wasn’t making much either with her third-shift office job at a freezer storage. And tree ornaments fell far down the list of priorities, far below the pinto beans and ramen noodles and below the meager gifts we’d been saving nickels to buy for each other. But luckily, there was this little grove of pines growing on barely high ground behind our trailer. So we gathered a Walmart bag full of pine cones, bought one can of fake snow and one spool of red ribbon. 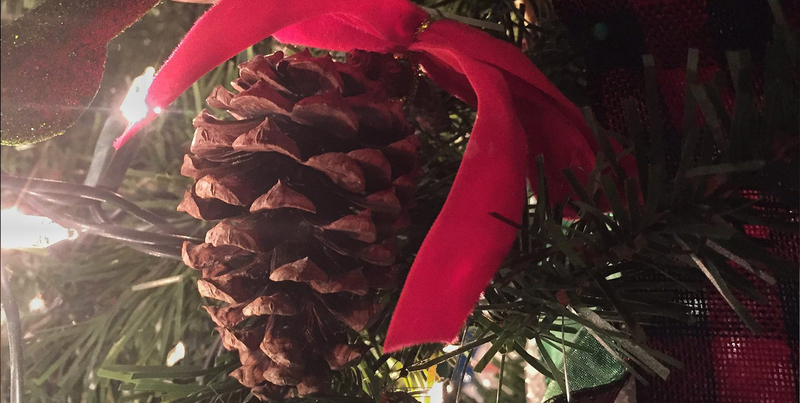 This is a photo of the last pine cone standing from that Christmas. It’s made it through 25 years of packing and unpacking, two daughters, two granddaughter’s, a few dogs, and a few cats. It’s been with us through laughter and tears, bliss and anger. It’s been there on Christmas trees under which gifts overflowed, and it’s been there when we couldn’t hide the Christmas tree stand. The fake snow has long since worn off. A few petals have broken, and I had to rewrap the ribbon. But the pine cone is on this year’s tree. Its presence, nestled in the boughs between glittery bells and twinkling lights, says more than words ever could about promises and commitment, about faith and family… about love. It’s easily the most beautiful Christmas ornament my eyes have ever seen.